As a teacher the amount of information given to me from 9.20-9.21 is unbelievable!!! Play dates, dental appointments, early collection, alternative carers…. It is so hard to remember it all when I eventually manage to sit down at my desk. It will probably be 11.00 at that stage and I should be on a lunch break. I know that getting kids out to school in the morning and trying to beat the traffic can be challenging to say the least. How about we meet 1/2 way on it?! Here is a free customisable School Note Template template that you can just print out and keep on the kitchen noticeboard or in the car door ;). It will make life easier for both of us. LOL! 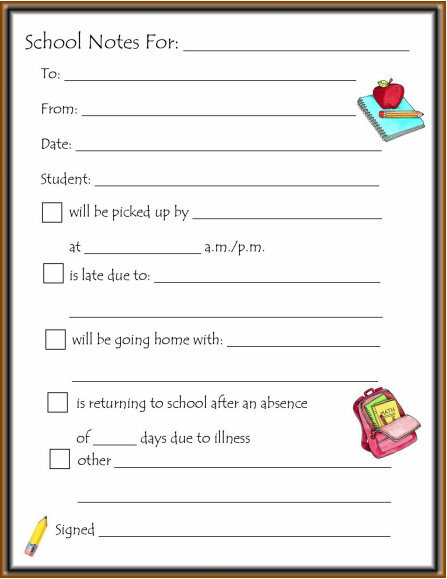 Thanks to http://www.mommypalooza.comfor this great School Note template.